For at least a decade, researchers have known that normal bacteria in the gut can induce intestinal immune cells to extend tentacle-like structures, known as dendrites, to "capture" antigens, triggering both immediate and long-term immune responses. What was less clear was how the bacteria activate this process. Now, a research team led by Osaka University has found that the molecules responsible have been hiding in plain sight. 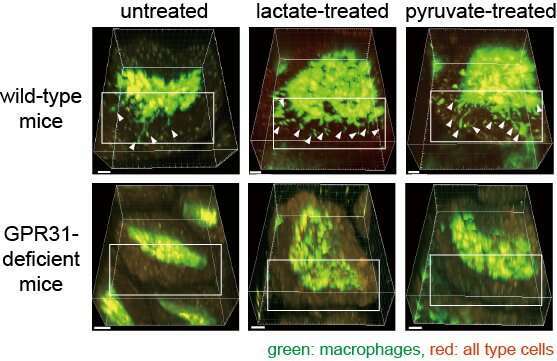 "After studying the available research, we hypothesized that bacterial metabolites present in the small intestine could possibly mediate dendrite protrusion," explains lead author Naoki Morita. 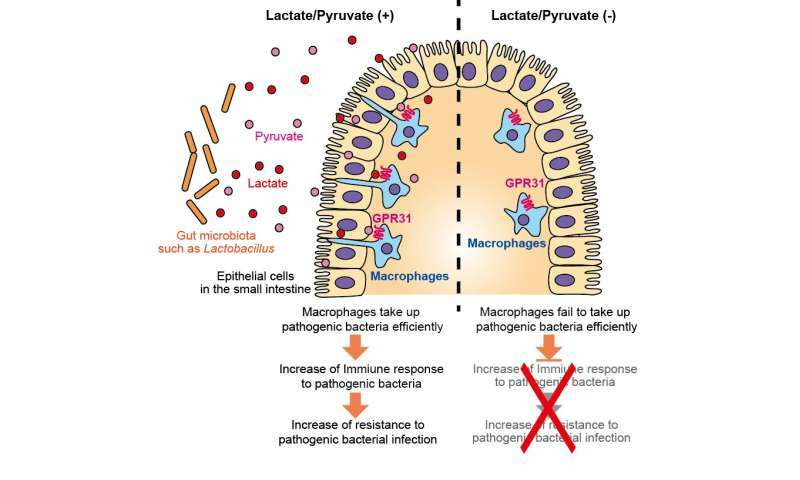 "After purifying different fractions from the contents of the small intestines of mice, we discovered that lactic acid and pyruvic acid, produced by lactic acid bacteria in the normal gut flora, act directly on intestinal macrophages." "We then examined whether pre-treatment of normal mice with pyruvate or lactate as well as non-pathogenic Salmonella could protect against infection with a virulent strain of the bacterium," says co-lead author Eiji Umemoto. "As we predicted, normal pre-treated mice, but not pre-treated GPR31-defective mice, showed increased survival and an enhanced immune response following infection with the virulent Salmonella strain." Corresponding author Kiyoshi Takeda explains that the research has multiple clinical applications. "Because these metabolites enhance the immune response, they could be used to improve the effectiveness of oral vaccines, while GPR31 is a promising target for therapies aimed at eliminating intestinal pathogens. Because of this, we expect that lactic acid, pyruvic acid, and GPR31 will all be explored in the near future as new targets for activating immunity."